We automatically sync the employees you select from Namely to Lattice. We mirror your reporting structure from your Namely org chart. When users are added or removed from Namely, we'll create them and deactivate them in Lattice with the click of a button. 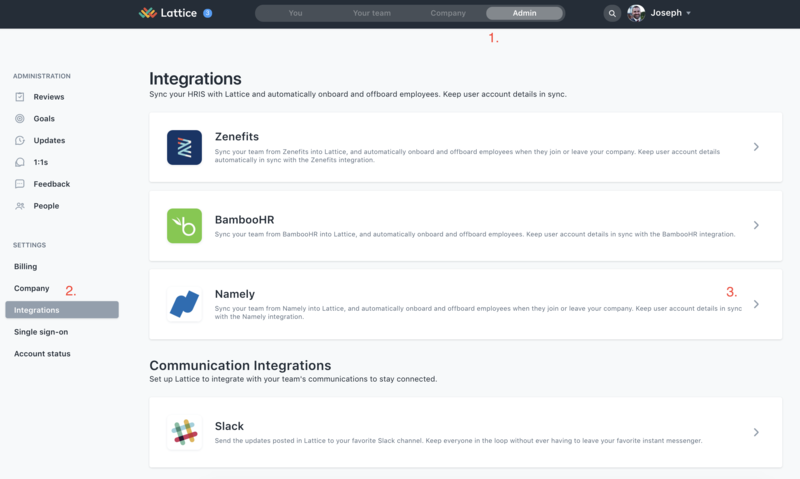 To sync your Lattice account with Namely, you must be an admin in both Lattice and Namely. What employee information will come over to Lattice from Namely? First, go to the Admin Settings page, then click on the Integrations sidebar tab. From the Integrations page, click the "Sync with Namely" button to open the configuration window. 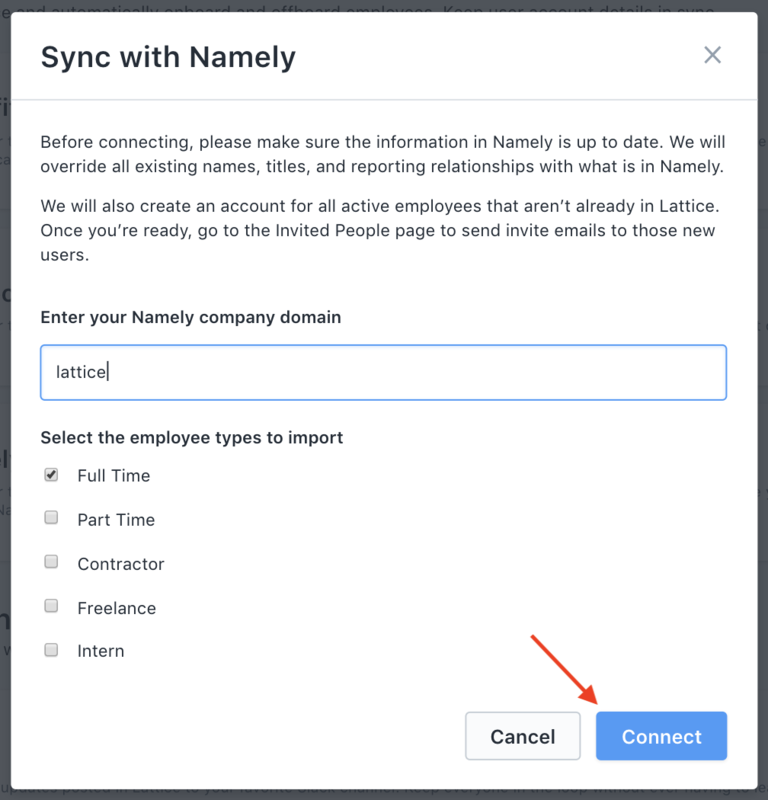 In the Namely configuration window, you'll need to provide Lattice with your Namely subdomain and select which types of employees you'd like to import. After you've supplied us with your information, click the "Connect" button to authorize Lattice to access your Namely data. After clicking "Connect", you'll be redirected to Namely's site and asked to confirm the authorization. Note that you must be logged in to an admin account on Namely to complete this step. Click the "Allow" button to proceed with the authorization. Your employee data will be automatically imported immediately after you've authorized Lattice, and when the important is complete, you'll receive an email notification with more information about the import. This will create accounts in Lattice for everyone that fits the criteria you've selected. Once your'e ready, invite them by going to Admin -> People -> Invited -> Resend All Invites. This will email the team for the first time and can also be used as a nudge to resend invites if employees are slow to accept. Even if you chose to auto-sync nightly, you will always have the option to manually sync during the day if needed. You can update the information you've imported from Namely at any point by clicking the "Resync" button in the admin Integrations page. This process will import new employees that don't exist in Lattice, update existing employee information, and deactivate uses that no longer exist in Namely. You'll receive an update email after the resync is complete. To remove your Namely integration, click the "Reset" button in the Namely section of the admin Integrations page. 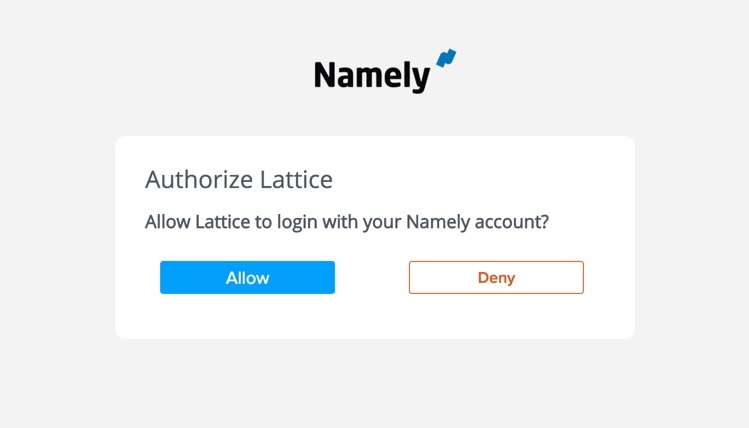 This will remove your employee type preferences and remove Lattice's authorization to access Namely data.